WASHINGTON, D.C., April 13, 2019 — Researchers hoping to better interpret data from the detection of gravitational waves generated by the collision of binary black holes are turning to the public for help. LIGO’s first detection of gravitational waves from colliding black holes in 2015 opened a new window on the universe, enabling scientists to observe cosmic events spanning billions of years and to better understand the makeup of the Universe. For many scientists, the discovery also fueled expansion of efforts to more thoroughly test the theories that help explain how the universe works — with a particular focus on inferring as much information as possible about the black holes prior to their collision. His team — and the scientific community in general — needs computing capacity to run the simulations required to cover all possibilities related to the properties and other information contained in gravitational waves. “Each desktop computer will be able to perform a single simulation of colliding black holes,” said Etienne. By seeking public involvement through use of vast numbers of personal desktop computers, Etienne and others hope to dramatically increase the throughput of the theoretical gravitational wave predictions needed to extract information from observations of the collisions. Black holes are known to contain two physical quantities: spin and mass. Spin, for example, can then be broken down further into direction and speed. Etienne’s colleagues, therefore, are examining a total of eight parameters when LIGO or Virgo detect waves from a collision of two black holes. 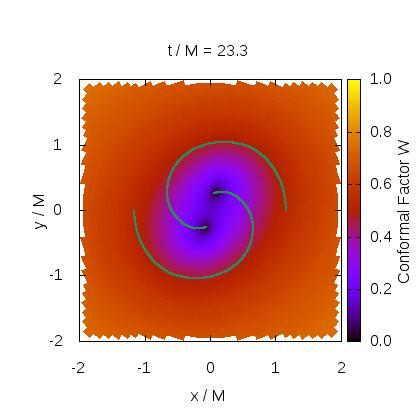 “The simulations we need to perform, with the public’s help, are designed to fill large gaps in our knowledge about gravitational waves from these collisions by covering as many possibilities as we can for these eight parameters. Current black hole simulation catalogs are far too small to properly cover this wide space of possibilities,” Etienne said. Etienne and his team are building a website with downloadable software based on the same Berkeley Open Infrastructure for Network Computing, or BOINC, system used for the [email protected] project and other scientific applications. The free middleware system is designed to help harness the processing power of thousands of personal computers across the globe. The West Virginia team has named their project [email protected] and expects to have it up and running later this year. APS will provide free registration to all staff journalists representing media organizations, professional freelance journalists on assignment, and student journalists who are attending the meeting for the express purpose of gathering and reporting news and information. Press registration grants full access to all scientific sessions, to the press room, and to the press conferences. We will also provide complimentary press registration to university press officers, PIOs and other professional media relations staff. Press registration grants full access to all scientific sessions, to the press room, and to the press conferences. Press credentials are approved at the sole discretion of APS. For press related questions about the APS April Meeting, email [email protected]>. A series of press conferences will be held during the meeting at the Sheraton Denver Downtown Hotel. The press conferences will be live webcast, and members of the media who are unable to attend the meeting in person may register to view the live webcasts at https://www.apswebcasting.com.